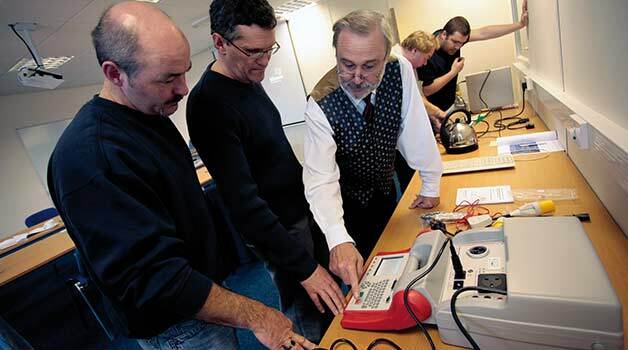 Taught by our expert tutors who have years of experience in PAT testing, our course is taught in an easy-to-follow, step-by-step fashion which makes it easy to understand portable appliance testing. Developed around the IET Code of Practice that governs PAT testing in the United Kingdom, the course is aimed at teaching you all the rules and regulations of PAT testing as well as how to operate PAT testing equipment. Those who successfully pass the exam/practical will be issued with a Certificate of Competence awarded by PASS. Our PAT competency course lasts for one day from 9AM to 4PM. This course is open to everyone and is especially suited for those with no PAT testing knowledge at all. We would suggest owning a copy of the IET Code of Practice, but full training materials will be provided on the day. Train to competently operate PAT testing equipment and safely test portable electrical appliances with our Liverpool PAT testing course. Ideal for those in Merseyside, Liverpool and the surrounding area, our PAT competency course is open to absolutely anyone who would like to learn how to PAT test. You don’t even have to have any prior electrical training! Taught by our expert tutors, the course mixes together both practical and theory work with plenty of hands-on time testing to get you familiar with the equipment. We highly recommend businesses wanting to PAT test their own equipment or those looking for a PAT testing qualification to create their own PAT business consider taking this course.